I flew over four hours tonight and had to go a bit high to avoid turbulence since there was a strong southerly wind flow and the expected resulting turbulence below 10,000 ft. The only problem was, it was about 15 degrees F up there and my heater was NOT cutting it. It used to always kick out plenty of hot toasty air but last night I could barely tell if it was working. I clicked it off and it did seem to get a bit colder, but there is definitely something wrong with it that needs to be looked at or I'm going to have more frozen fingers during this unusually cold winter! The other item on my squawk list is that the left fuel gauge seems to have become unreliable. A few times it dropped off to zero during the flight and then popped back up to full. Looks like I have a trip to the maintenance shop coming up. With all that wind, I was sure glad to have excess power available. As I headed back north against the wind I had 55-60 kts on the nose, with moderate turbulence which was no fun at all. 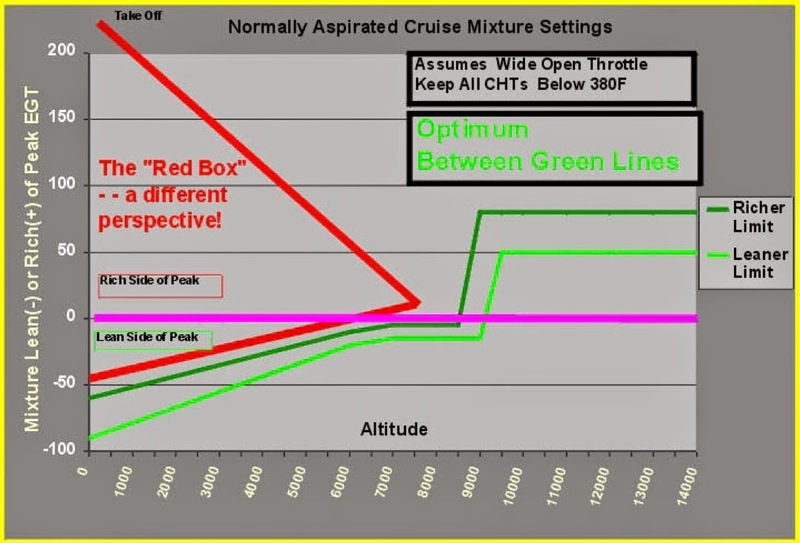 At one point I had WOT and 2500 rpm, nose high and 130 kts indicated and only a 300 fpm climb. In a lesser plane I would have been sinking at 1000 fpm. 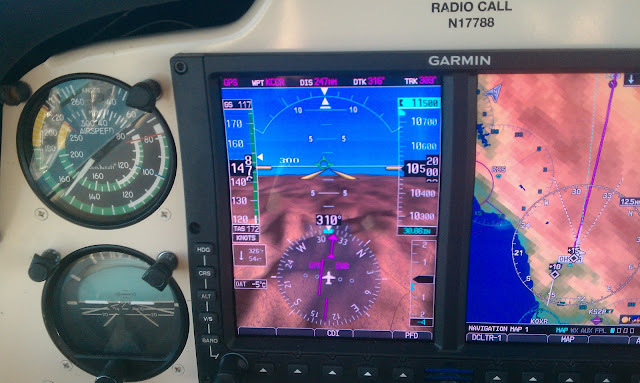 Once I finally got leveled out over 10,000 the turbulence died down but here I am doing only 117 kts over the ground! ADAM: Thanks for the note on the ferrous metal in the screen. That's always cautionary, and it's something to monitor. Wear metals were a little on the high side for only 20 hours on the oil, but iron was the only metal that really increased. Universal averages show typical wear levels after about 40 hours on the oil. This engine averaged about 5 hours per month, which is borderline inactive in our book, so that might explain these metals. Silicon was on the high side again, but if the air filtration system is okay, it's likely just a harmless sealant. Check back in another 20 hours. ADAM: This right hand IO-520-E looks a lot like its twin, which is what we'd expect for two engines in the same aircraft operated by the same person. You found ferrous metal in this screen as well, so we have to treat this as a cautionary report, though the fact that both engine look so much alike is a good sign. Wear actually looks a little better this time, so hopefully we'll see even more improvements in the next sample. No fuel or moisture was found and silicon is heading in the right direction. Stay vigilant and check back in another 20 hours. Here is a shot of the chipped lifter which we removed from my left engine. 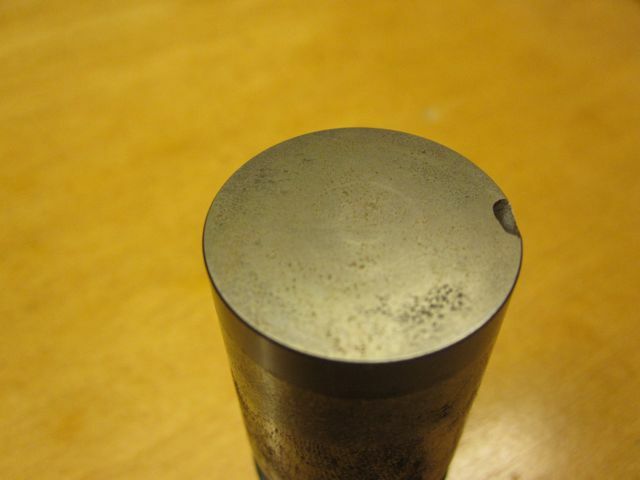 It shows the corrosion on the lifter too, which is the slight pitting that you see on the face of the metal. It's interesting since it is likely indicative of the what the rest of the lifters look like. They really should be perfectly smooth. If indeed the small amount of metal I found in the screen came from the Cam, it's likely that these rough spots caused by corrosive pitting are wearing away or "eating" at the Cam lobes. If all this sounds like Greek, which it did to me before I owned an airplane, maybe this image will help. The Cam is the pipe on the top which has these oblong lobes on it. As the engine turns the Cam spins with it and is timed so that the lobes move these lifters or "tappets" which are connected to rods which open and close the fuel intake and exhaust valves in time with the engine. Apparently the level of pitting on my lifters isn't all that bad for a 1400 hr engine since Continental doesn't recommend replacing them unless more than 10% of the face has pitting. Hard to tell but the worst area in the bottom right region looks like 10% or less to me and this was one of the worst lifters in the engine. The rest were the same or better. We replaced it due to the chip in it and I left the rest alone. I now have about 75 hours on the plane and Sunday I did the 3rd "owner assisted" oil change. I ran into my friend Oleg at the airport, who is also in the NRI flying club, and took him for a quick flight to "warm up the oil". We shot an approach and I showed him how the plane pretty much flies itself right down to the numbers. After that I started taking the cowl oil drain access panel off. I've got most of the oil change stuff down for the most part, except I'm not comfortable doing the safety wiring just yet. My friend and A&P Paul came out to help, and I wanted to do a really thorough cleaning of the screens to check for metal. I picked up some Mineral Spirits from Home Depot and we pulled out the oil screens and I soaked and brushed them thoroughly. 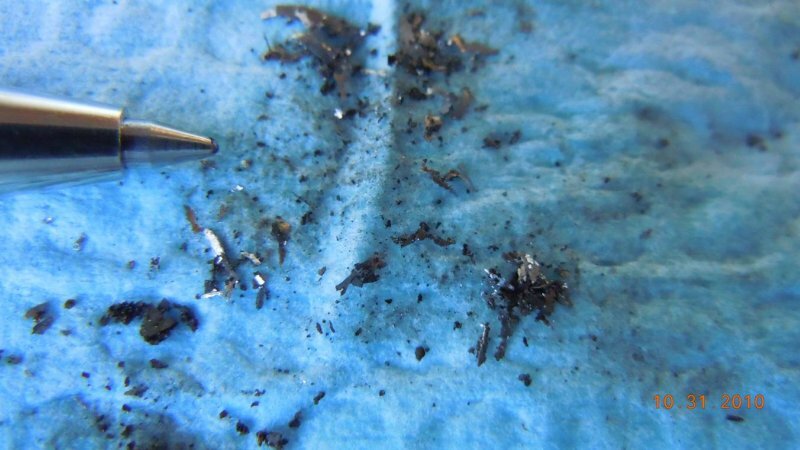 Unfortunately we found small amounts of ferrous metal in both engines. The left engine had maybe half of a pencil eraser worth of dark mud like bits, and maybe one or two small flakes a millimeter or so long. The right engine had about twice that amount with more flakes. We took this photo of the gunk from the right engine with a macro lens, which makes it look huge but by reference that's the tip of a ballpoint pen on the left. If you balled it up it would be about the size of the tip of the ball point pen. Paul isn't too worried and thinks I should just keep flying it, but we will continue to change the oil every 20 hours or so and keep an eye on it. I'm also again sending the samples off to Blackstone so we'll see what they say.